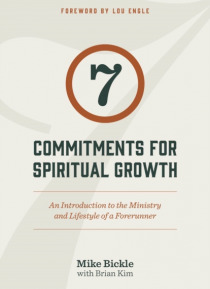 In 7 Commitments for Spiritual Growth Mike Bickle and Brian Kim present a compelling prophetic wake-up call to the Body of Christ in this generation by outlining the need for the ministry of the forerunner. This prophetic call is backed up with practical wisdom on how to use these seven foundational commitments to live in wholehearted abandonment to Jesus in the power of the Holy Spirit. These pra… ctical steps have been a key to the spiritual growth of believers throughout the centuries and are necessary for those who will not settle for anything less than radical pursuit of God.